Dumping those diapers - FirstMed - Your Health Comes First! While there is no set age when toilet training should begin, the right time will depend on your child’s physical and psychological development. Most parents want to start “potty training” from an early age, but children under the age of 12 months have no control over their bodily function. A little control begins about six months or so after that point. Optimally when they are between 18 and 24 months, those starting to show signs of being ready can start training. Some children may not be ready until almost the age of 2½, with others going beyond that. Getting a feel for your child’s readiness can be delicate work. One of the first signs to look for is that your child must also be emotionally ready. He/she needs to be willing, not fighting, to give up the diaper (or “nappy”, depending on where you are from). At this point it is best to be relaxed about toilet training, knowing there are going to be setbacks and accidents. Avoid getting upset at mistakes or getting into power struggles. Children at this age are becoming aware of their individuality, looking for ways to test their boundaries and your limits. Some children may even do this by holding back on bowel movements. Facial expressions, posture or words reveal that your child is about to urinate or have a bowel movement. It won’t take you very long to learn what the “pee-pee dance” looks like! Your family has just moved or is about to move. You are expecting a baby or you have recently had a new baby. There is a major illness, a recent death or some other family crisis. However, if your child is learning how to use the toilet without problems, there is no need to stop because of these situations. You should decide carefully what words you use to describe body parts, urine and bowel movements. Remember that friends, neighbors, teachers and other caregivers also will hear these words. It is best to use proper terms that will not offend, confuse or embarrass your child or others. Avoid using negative words such as “dirty”, “naughty” or “stinky” to describe waste products. These terms can make your child feel ashamed and self-conscious. Treat bowel movements and urination in a clinical, matter-of-fact manner. 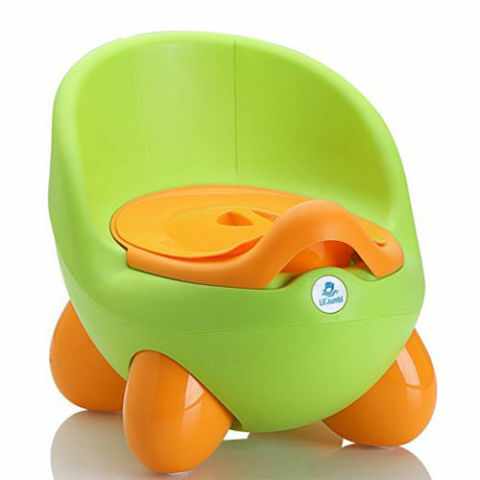 Once your child is ready, you should choose a potty chair. A potty is easier for a small child to use, since they don’t need help climbing up to it and their feet can reach the floor. Children are often interested in their family’s bathroom activities. It is sometimes helpful to let children watch parents when they go to the bathroom. Seeing grown-ups, or older siblings, use the toilet can encourage them to do the same. If possible, mothers should show the correct skills to their daughters, and fathers to their sons. When concerns come up before, during or after toilet training, speak with your pediatrician. Often the problem is minor and can be resolved quickly without physical or emotional stress. Your pediatrician’s help, advice, and encouragement can help make toilet training easier.